If dressing stylish for the night is how you like to roll, just add some easy to wear tuxedo jackets and dinner jackets by Tazio. These Italian designed dinner jackets have that quick spruce up appeal that will transform what you're already wearing to really looking the part. 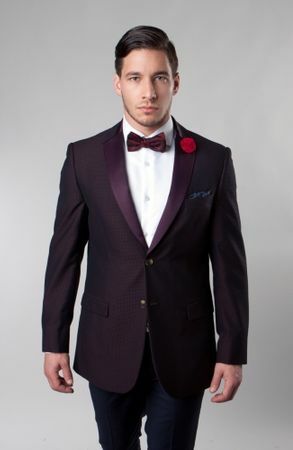 This burgundy color tuxedo jacket features satin style lapels and has double vents in the back. Made of poly/rayon with a modern style fit.